Mrmr - For iOS users such as iPhone, iPodTouch, and iPad. Follow the instruction above to configure Mrmr application. SMS - For mobile users without network capability. Send a text to 330.366.6740 during the performance. NoBarrierOSC - For none iOS smart device users.Go to http://www.bubblyfish.com/moori on a web browser during the performance. Q: Does SMS run well in this environment? Does SMS work as efficiently as OSC controller? Is both SMS and Mrmr are required? Moori was originally developed for Mrmr only. However, the current version of Mrmr is implemented in only iPhone, iPad, and iPod touch. I realized that there are as many iPhone users as I expected. I had to limit many potential audiences because they didn’t have a particular phone model. Thus, I decided to develop the SMS service. However, at the user testing session which SMS was first implemented, SMS messages didn’t arrive to the mail server promptly, and Mrmr server kept on crashing. I was advised to choose between SMS or Mrmr by some people, and my experiment did not go well. I was discouraged and during a feedback session after a user testing, I asked testers which feature should be included. Despite of the delays and technical issues, testers strongly suggested including both the SMS and the Mrmr feature. This prompted the integration of the quicker, mpop solution which considerably decreased the delay. Q: How long does it take for participants to set up Mrmr? Can questions be efficiently swapped from Mrmr server? During the user testing, I created a Mrmr set up instruction page, and displayed on the screen. People were able to follow step-by-step directions by the performer, but had trouble following the instructions on the screen, which caused significant amount of delays in the concert. I also noticed that the network did not refresh although a new network was chosen in the setting. 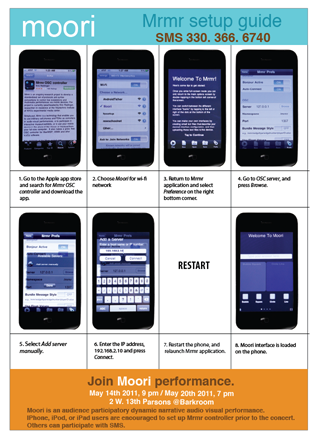 After downloading the application, users had to restart phones to receive designated network. As a result, I realized that a step-by-step instructions need to be given to the participants prior to the concert for them to try and trouble shoot.